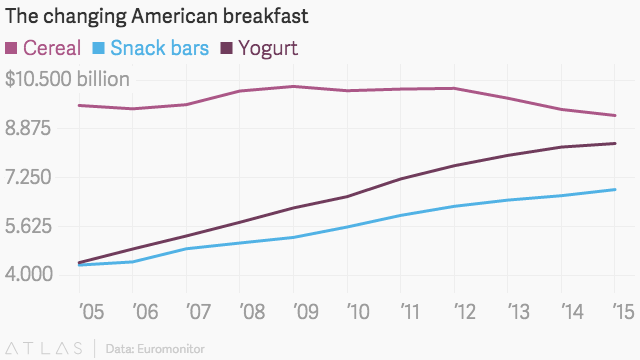 The future of breakfast looks dry. The future of breakfast cereals may very well be served up in a pouch with no milk. At least, that’s the future General Mills is creating. The company in June will roll out several products that make breakfast a meal increasingly consumed on the run. Single-serving pouches built for easy snacking and more breakfast bars are in the works. The company says that breakfast has evolved and that with it, traditional cereals are challenged to remain relevant as consumers—particularly younger ones—change their habits. That kind of thinking may prove crucial for the big name cereal brands. Even though their top cereal products can still be found in more than 85% of US households, sales growth has dropped off in recent years. Younger consumers, some of whom are already eschewing milk, just aren’t interested in sitting down with a bowl of cereal, in part because it’s too messy. According to data provided by Euromonitor, the total volume of breakfast cereal in retail declined by 13% between 2005 and 2016. Cunningham said General Mills will keeping making traditional breakfast cereals, but shoppers will start seeing his products in other aisles of the supermarket. What those will look and taste like could stretch the imagination. Kellogg’s in December 2015, for instance, was conducting market research by joining forces with big-name chefs who experimented with dishes that included braised Raisin Bran and Corn Pops topped with an egg and stirred into bacon-infused soy milk. 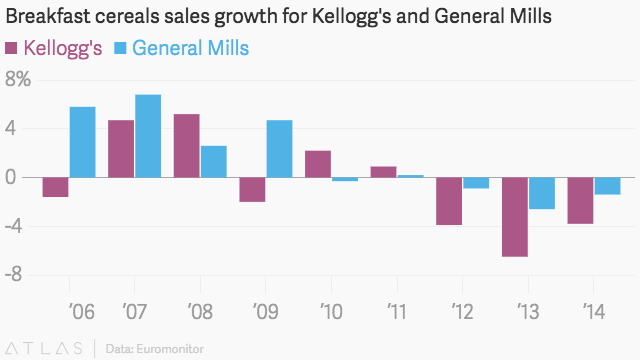 Don’t expect anything that wacky from General Mills in coming months. The company plans to focus on single-serving packaging and new brands such as Nature Valley Baked Oat Bites and Tiny Toast (neither of which require milk).